Necessity being the mother of invention, it makes sense that a mom came up with Simple Sarongs. Kami Darnell got the idea while playing with her children at the pool. She wanted something to throw on over her wet swimsuit that wouldn’t cling, fall off, or add bulk to her beach bag—or her body. The result was Simple Sarongs: full-size, lightweight beach towels that double as attractive cover-ups without the use of knots, tucks, or itchy Velcro. Kami uses custom woven, 100% cotton terry velour that is luxuriously soft and absorbent, then adds two cleverly placed buttons and eight buttonholes. Wear the towel like a skirt below the hips or buttoned around the waist or under the arms. Simple Sarongs stay securely in place and, thanks to a flattering A-line design, float attractively away from the body. Save room in your beach bag with one simple way to cover up and dry off fast. Hi everyone! I'm happy to present Simple Sarongs on The Grommet today. 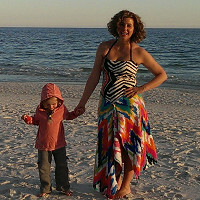 I'd be happy to answer any questions you have about beautiful beach towels that easily button up into a Simple Sarong. @andrea Good question! They do have prints on both sides, but only have the buttons on one side of the towel. Some of our customers who want the inside print on the outside just button it inward, if that makes sense. What a wonderful idea! I take aqua exercise classes so this would be great. I am a full figured woman though...size 18-20. What are the dimensions of the towel & how large will they fit? @Debbie They mentioned several buttonholes. These would allow buttoning at different sizes. @Debbie I love aqua exercise, too, and these towels are perfect for throwing on after that workout. Our sarongs easily fit with both buttons buttoned up to a size 16. But some of our customers who are size 18-20 just button one of the buttons, and it works perfectly! The buttoned circumference goes from 24 inches up to 41 inches, and can expand larger of only one of the buttons is buttoned. @Kami Great! Knowing the circumference is helpful. After I posted the question, I saw the towel dimensions. Sorry about that! Do you know what the circumference is with just using the one button? @Debbie No worries! Happy to answer all questions! The circumference buttoning one button goes up to 47 inches. @Judy I agree! I hope to introduce a junior (pre-teen) version of this in my next collection. I LOVE this idea, it's brilliant! Living in Southern California, we spend much of our Summer at the beach, the spa....best of all, it's perfect for lounging around the County Club pool! It really is a MUST-HAVE for any woman over 29. (yep, that would be me...not the 29 part...the "over" part) Thank you for inventing this. Sarongs have never worked well for me, this is so simple, practical and best of all adjustable! @Cynthia Thank you so much for your kind words! This is an easy lifestyle product for us women, and I know you will absolutely fall in love with it! Cynthia, we love seeing Makers supporting other Makers! For those who don't know, Cynthia is the Maker of Wrapadoo. Wrapadoo and Simple Sarongs: the ultimate spa duo! @Mike, It's very easy to support this "Maker", she's created a fabulous product that solves a "big" problem for me. I love my Grommet family, always happy to support and encourage some well earned attention & accolades. Have a great launch Kami! Thank you so much, @Cynthia! Glad to be part of the Grommet family of merry Makers. Yes, you are right @Mike - many of our customers use our sarongs as spa wraps at home for a light and absorbent robe. Sounds like adding a Wrapadoo would be a great pairing! Hi Kami! Love this idea! Where are the Sarongs/Towels made? @Kay They are made exclusively for us near Hong Kong, China. We searched high and low for a towel manufacturer in the U.S. who does the vibrant edge to edge printing that is needed for our sarongs, and discovered that there are none in the U.S! China has the technology and experts for towel printing. Many of our buttons are from a U.S. company, and we work with talented textile designers, (who happen to all be women), graphic designers, photographers who are right here in the States. I am going to the beach for the first time post-baby #2 and have been looking for something to make me feel a little more comfortable in this new body while chasing my two-year-old around. Seems like this might be a great fit! Does it stay in place enough for wrangling a little one? Thanks! @Ashley Thank you for your comment! The last thing you want to be doing while chasing kids at the pool or beach is worrying about your cover-up. Our sarong will absolutely stay in place, and give you that post-baby poolside confidence! @Kami - Fabulous! I wanted something that would allow me to get a little sun while playing with my girls - sounds perfect! I also like the idea that it reduces the number of items that I have to tote down to the beach too...double win. @Ashley Sounds like a perfect match for you. Yes, wear it to the beach, then take it off and throw it on your beach chair or pool lounger. Thanks again! I actually have one of these and LOVE it!!!! :) If anyone is asking who can wear this...here's a good scope. I have a daughter that is 20 yrs old, 6'2" and loves to have this for the beach. She wears it into the club to have lunch with friends. I am 47 yrs old, 5'10" and I wear mine at the beach to take a stroll or at the pool. I love the bright colors and the convenience of wrapping it around my waist or chest. My mom is 71 yrs old, 5'2" and loves it for the beach when she is visiting. So, any age or height. This Simple Sarong is the answer to every cover-up dilemmas!!! @Missy Wow! Thanks for letting us know! Sounds like it has been a generational product that works for women of all ages and sizes in your family. Necessity being the mother of invention, it makes sense that a mom came up with Simple Sarongs. Kami Darnell got the idea while playing with her children at the pool. She wanted something to throw on over her wet swimsuit that wouldn’t cling, fall off, or add bulk to her beach bag—or her body. The result was Simple Sarongs: full-size, lightweight beach towels that double as attractive cover-ups without the use of knots, tucks, or itchy Velcro. Kami uses custom woven, 100% cotton terry velour that is luxuriously soft and absorbent, then adds two cleverly placed buttons and eight buttonholes.